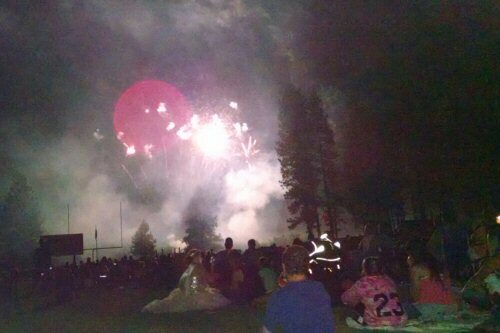 The wonderful Burney fireworks display is always one of the highlights of Burney Basin Days. After a day of parades, barbecues, shows, and festivities; the rockets red glare and bombs bursting in air bring the day to a dazzling conclusion. The fireworks program is organized and hosted by The Rotary Club of Burney and Fall River Mills. Before the fireworks there is a full pre-fireworks program. 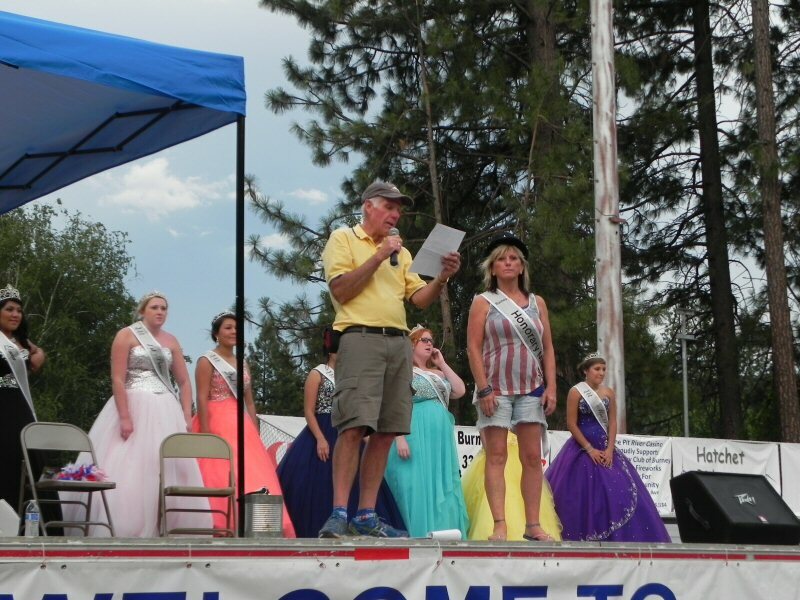 The new Burney Basin Days Queen and her court are introduced. The new Honorary Mayor of Burney is also recognized. Music is played and announcements are made. Sponsors and vendors are recognized. For the 2015 Basin Days Fireworks Program, something new was added. At the February meeting of the Burney Basin Days committee, George Whitfield suggested having an open mic at the fireworks program and the idea was approved. George asked me if I would host the open mic. At the April meeting, the committee decided that instead of having an open mike, we would feature a showcase of local musical artists who wished to volunteer their time and talent. This article gives a glimpse of some of the entertainment provided as a result. Performers are introduced in the order that they appeared on the stage. The MC for the event and overall organizer of the fireworks program was Bill Campbell of the Rotary Club. My wife, Linda Colvin, was busy taking both videos and photographs. She couldn’t capture every song. However, the sampling she did record, provides a good taste of the happening for those who were unable to attend and for posterity. Kermit “Butch” Minor, assisted by his wife and son, did an excellent jot of providing sound for the program. Naturally, since George came up with the idea, he was one of the first on the list. George is a past president of the Lions Club. He used to perform with the Burney Basin Band. George and I decided that we would share a spot to kick the program off. I met Jeff McNeil at a joint social of the Burney and Fall River Chamber of Commerces at the Clearwater Lodge in the Spring. He was singing “Mama Tried” by Merle Haggard. Jeff recently moved to the Intermountain area. He has been a blacksmith and a cowboy for 35 years. He also served as a trail guide in the Sierras. 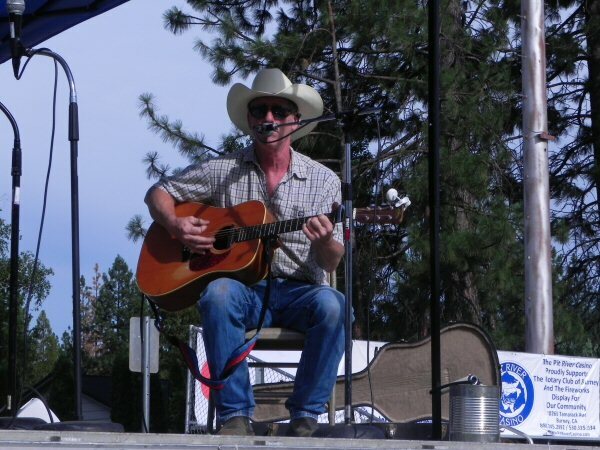 Jeff has been playing music for a long time and knows a wealth of cowboy and country tunes. When I asked him if he would like to play in the talent showcase he readily volunteered. We didn’t get a video of Jeff’s wonderful performance. However, he has been playing at the Rex Club and the Fall River Hotel. If you stop in, you can experience for yourself why he got a call for an encore and hoops and hollers of appreciation after he performed. One of the first groups to volunteer to play were Martin and Vicky McAbee. Marty and Vicky have been playing at local churches, the community center, and local open mics. They wrote the song “Ring the Bells of Freedom” for this event. Gerry Goldman and Honey Storlee are becoming well known in Northern California music circles. They play as a duo and with a group named the Mountain Messengers. They were recently featured on the Round Mountain public radio station and regularly play at the Farmer’s Market in Redding and local festivals. Honey lives in Redding and studies ministry at the Bethel Church. She loves sharing her musical gift. Jerry plays guitar and banjo and has accompanied many musicians in the Intermountain area. No representation of local talent would be complete without music from the members of the Pit River Tribe. The Pit River Basin is their hereditary homeland. 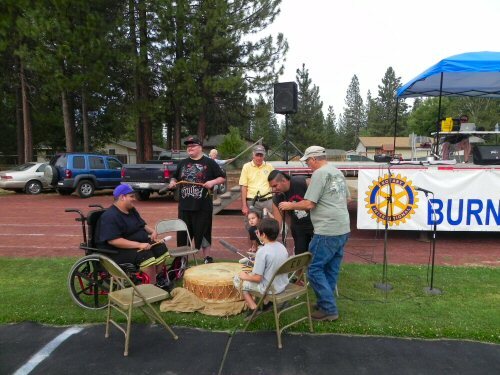 Each year the Pit River Tribe sponsors a Pow-Wow that brings people from all over the West to Burney. I was so happy when Ira Winn agreed to ask the Pit River Nation Drum Group play at the fireworks show. Ira introduces the members of the group in the video. After they had played and sung a couple of songs of honor and blessing, Ira got a spontaneous inspiration. He called to his cousin Crystal Flores, the 2015 Burney Basin Days Queen, to lead a Round Dance. The Round Dance is a traditional dance of friendship. The final act of the Talent Showcase was a joint concert by band members from Burney and Fall River Mills High Schools organized and directed by Hugo Castro. Mr. Castro is the music teacher at both schools. When I first contacted him in the Spring, Hugo was busy organizing four concerts for the end of the school year. On the last day of school, we spoke again and he proceeded to put together a program combining some of his best students from both programs. It was wonderful to have such talented young people perform, rounding out the program with a special flare. Many thanks to the Burney Basin Days Committee and the Rotary Club of Burney and Fall River Mills for including the Talent Showcase in this year’s program. Thanks to all of the performers who donated their time and talent, and to Kermit to making it all sound so good. Thank you very much to the school district and Burney High School for the use of the football field. I would especially like to thank Jill Barnett, the Chairperson of the 2015 Burney Basin Days Committee, for all her work coordinating and supporting all of the events sponsored by all of the organizations, businesses, and individuals who worked long and hard to make the 2015 Burney Basin Days a success!